When I look back on all my 2015 FN posts though, a particular one stands out in my memory, and that is the Field Notes Item Numbers post. Not necessarily because it got some attention but because it sat in my drafts folder for over a year, and I doubted the idea the entire time fearing I’d be judged for it. But I’m glad it’s out there now; it was a lot of fun, and it felt good to finally hit that Publish button. In addition to all the Field Notes posts, I wrote about my other favorite stationery topics, namely journaling and notebooks. I was excited to learn that people actually read them, especially my journaling setup posts, so I’m glad I branched out. I also got deeper into wood-cased pencils in 2015, so I wrote a few pencil-centric posts. Back in March, I also started a series of link posts called Extra Staples in an effort to keep up with the news and connect with fellow stationery-enthusiasts. It’s so irregular that you might think I gave up on it, but I haven’t and I plan on continuing it. Notebooks I filled in 2015 for working on Three Staples posts. One of the biggest things that happened in 2015 is that the audience grew here at Three Staples. I would attribute that to several blogs and podcasters that have mentioned this site throughout the year (including Field Notes themselves!) so thank you, thank you, thank you. I am happy that what I share online is of some interest to people, and I thank all those who visit or follow Three Staples on Instagram and Twitter, even though I don’t post regularly. I know everything is vying for your attention these days, so I appreciate those who take the time to write comments, tweet, and “like” my stuff. 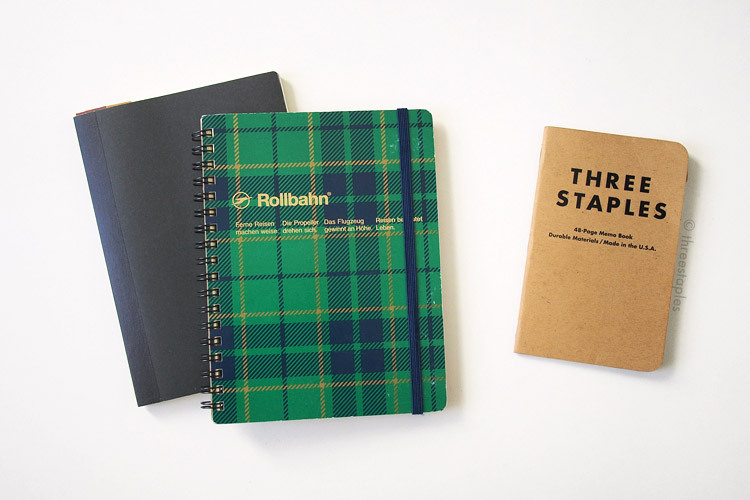 And who knew I would make some great friends online by writing about pocket notebooks? For a painful introvert like me, that’s quite an accomplishment, and one of the best things to have happened through Three Staples. So thank you. And I would not have started this site if it weren’t for many great stationery-related sites that came before me, so I thank them very much for the support and inspiration. Before I get too sappy, I'll close with a rundown of some 2015 posts, in case you missed any of them. Who knows what the new year will be like but I’m looking forward to it! I have no concrete roadmap for Three Staples, but at the very least I’ll continue what I’ve been doing and make sure to enjoy the ride. Thanks for reading, and I'll see you on the other side!